Stories can be as complex as any scientific theorem. When it’s done well, it demands our attention and consideration about something that might first seem black and white but is in fact as colorful and as intricate as the light spectrum. More importantly, stories can lead to new ways of thinking about who we are, as writers and readers…and scientists. Dr. Shane Stadler had a taste for storytelling long before he published his first novel, Exoskeleton. But only since becoming an experimental physicist has Stadler’s knack for stringing words together into a precise formula earned him his first publication, and then another. And his successes as a published science-fiction author don’t end there. In just a few short months, the third installment in his Exoskeleton series, Omniscient, is slated for release. Stadler’s series follows William Thompson, a convicted felon, who is given a choice following his sentencing. Thompson must choose between serving a twenty-five-year conventional prison sentence…or spend 365 days in a new, experimental corrections program. He opts for the latter but quickly realizes the situation he’s walked into. Beyond the world he’s created, Stadler’s work as an experimental physicist in the College of Science’s Department of Physics and Astronomy looks into the synthesis and characterization of bulk and thin film materials with an emphasis on magnetic systems with applications in energy and electronics. And it is this experience as a scientist that has provided Stadler with the proper technical insight into the world of science fiction and an element of uncomfortable authenticity to his sci-fi thrillers. CoS: What originally sparked your interest in science? Shane: The space shuttle program is at least partially responsible for my early interest in physics. I recall thinking that, by the time I got out of college, we’d be taking regular excursions into space – perhaps to the moon again, or Mars. As we know, that has not been the case. But along the way I learned early enough there’s a lot more to physics (and science in general) than space travel. CoS: What kind of work do you do as an experimental physicist? Shane: Generally speaking, an experimental physicist designs experiments, constructs experimental measurement devices, and carries out the experiments by making measurements with scientific instruments. The data collected from these measurements are used to either test existing theories, or to learn something new about the world (i.e., possibly reveal new physics). Experimental physicists not only need to understand theoretical physics, but must also have a variety of skills and knowledge including mathematics, chemistry, computer programming, electronics, engineering, machining, optics, etc. The physicist’s specific field will determine which of these skills must be most highly developed. My field is condensed matter physics (sometimes referred to as solid state physics). This is essentially the study of matter including its structural, physical, electronic, magnetic, and thermal properties. Research in condensed matter physics has led to novel physical behaviors such as superconductivity and spintronics, as well as to practical applications such as light emitting diodes (LEDs) and transistors, the latter of which have changed our world as they are responsible for modern computers and communications. In my lab we study magnetic materials of various types. We synthesize new materials (metallic alloys) that have never before been made, and study their magnetic, structural, and electronic properties. Lately, we have focused on materials that can be used in future “magnetic cooling” devices. In this case we search for materials that cool down when subjected to a magnetic field. The hope is that these new materials will drive the development of new near-room-temperature cooling technologies (i.e., refrigerators, air conditioners, etc.). CoS: When did you start writing fiction? Had you already kicked off your scientific professional career? Shane: I started writing short stories in grade school, and I took a creative writing course in college where I wrote some small things, as well. Since a very young age I’ve had ideas for books brewing in my mind, a few of which I’m finally putting to paper. And there are many others I’d like to write. 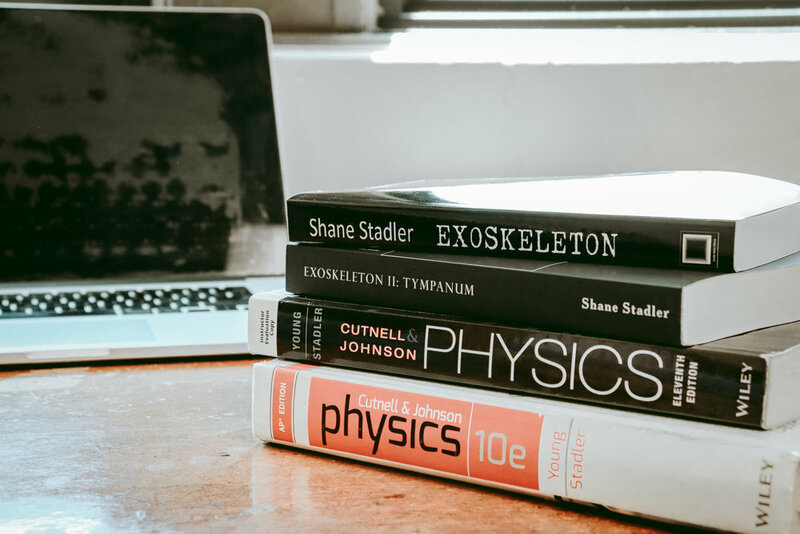 But my first novel, Exoskeleton, was published (and was written) after I became a physics professor, so I starting writing fiction well after starting my scientific career. CoS: Did you pull from your own background as a physicist to develop the story of William Thompson? CoS: What is your take — as a physicist by trade — on the relationship between science fiction and science in reality? Shane: Science fiction is supposed to be an extrapolation of accepted science (although the constraints are not very stringent) to some not yet realized technological possibility. This often extends from futuristic technologies to speculations on their effects on society. For instance, what would happen in a world where genetic research cured the human race of its most deadly diseases and slowed the aging process? What would happen to the population, and how would society need to adjust? How would life change for the individual? Sci-fi might bring some of these questions to the forefront and get people thinking about many hypothetical situations that could come up in our (real) future. CoS: To what extent do you think science fiction can affect or improve the developments in science and technology in human life? Shane: Many of the things that have appeared in old science fiction have been realized (e.g., the moon landing — Jules Verne’s From the Earth to the Moon, etc.). I think that, like some other types of fiction, Sci-Fi can be mind-expanding. Another important side effect of sci-fi is to get others interested in science and STEM fields, especially young people. CoS: Many aspiring science fiction authors don’t have a technical background in physics or another “hard” science. What can a writer do if their story involves advanced technology/science to keep the reader from hurling the book across the room? Shane: I would suggest that writers do some research to avoid any obvious mistakes. Just having a basic knowledge of things can be enough – most readers aren’t reading sci-fi to take a physics class. Many readers appreciate a non-expert’s explanation of otherwise complex and tedious topics. However, I think it is prudent for an author not to focus on something (science or otherwise) in which he/she is not comfortable. For instance, I would never try to write something that requires details of accounting or investment analysis. On the other hand, I can have a character address such things with the understanding that the character is not an expert. CoS: Are some areas of science and technology easier to write than others? Is it more difficult to properly integrate something like synthetic biology than, say, advanced A.I.? Shane: I do think it’s true that some technical areas are more difficult to write than others. But it really depends on how well a writer can formulate what is needed to get the point across to the reader without burying them in the details of complex scientific concepts or jargon. The writer should have a good idea of the novel’s target audience. I happen to also write a physics textbook, where I have to be continually aware of the level. In this case, regarding the math level of the book, for instance, students need to know algebra and trigonometry, but no calculus. I also have a feel for the general difficulty level (i.e., for homework problems and exams, etc.) that is expected to be accessible by these students. My experience here has also helped me with my sci-fi writing: I know what I should expect a student in an algebra-based physics course to understand or, better, what I should NOT expect them to understand. I think this gives me some perspective of what I should assume that someone who has not taken a college physics course should understand. After all, all of my students initially fit into that category! CoS: Ok, how about a tip for readers. How can a layman reader improve his or her scientific nonsense-detector? What should be a clue that the author has done a good job, or a bad job, integrating correct science in their work? CoS: What would you say was the hardest thing about writing these novels? CoS: What’s more challenging: being a sci-fi author or being a physicist? Shane: They both have unique challenges: it’s more difficult to become a physicist (a lot of schooling, etc.) but much more difficult to make a living as a sci-fi writer. What’s challenging is managing the time and effort to do both. Even though I write sci-fi for enjoyment and stress relief, I have come to appreciate that creative work takes a lot of effort. But science also has a creative component that, in my opinion, is not very different from that needed for writing fiction. Both disciplines require generating ideas from nothing, and that’s often not very easy, and is difficult to maintain. CoS: If you could choose to live in any science fiction world, which would you pick and why? Shane: That’s a tough one … as a kid I always liked the ideas the Star Trek (Next Generation and Voyager) worlds. There was the premise of a highly advanced civilization coupled with the adventure of putting its advanced technology to work. However, even though Star Wars has no real science (or even a façade of science), I liked its mystical component. I personally enjoy reading books that cross genres, and that’s what I write. 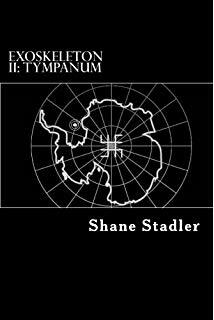 Exoskeleton and Tympanum have elements of sci-fi, thriller, horror, and even supernatural genres. Holding strictly to the sci-fi genre can be too constraining in my opinion. My physics life (which involves a colossal amount of writing as well) keeps me within empirical confines – laws of physics and measured data. Perhaps that’s why I’ve turned to writing fiction: it allows me to break free of that on occasion. CoS: What's the oddest / most dangerous / craziest thing you've done "for science"? Shane: Not too crazy … In grad school, a fellow student and I dropped a pebble from a walking bridge that went over a river. It took between 1.5 and 2 seconds for the pebble to hit the water, so we did a quick calculation and estimated that the fall was about 45 feet (plus or minus a few feet), and the final speed at the water was around 35 to 40 m.p.h. So we jumped. All was okay with the impact with the water (our calculations were close enough), but what we’d failed to consider was the thermodynamics of the problem: this was a river in the northern Midwest in April (ice just off the river)! We weren’t in any real danger, but it was pretty cold … Not recommended.